Value Vet uses a reference lab for our laboratory testing needs. This allows us to offer a wide range of tests which are performed in a state-of-the-art building by trained professionals. We recommend all patients have a full wellness exam annually to ensure a preventative health plan can be tailored to your pet’s needs. 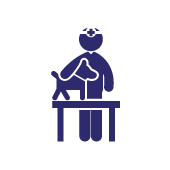 We also understand that your pet may need care outside of a annual visit and are available for sick exams, new pet exams, and geriatric exams. Because ID tags can be lost, Value Vet recommends all patients be microchipped. ALL dogs and cats should be spayed (female) or neutered (male)! If you do not surgically alter your pet, YOU will be risking your pet’s health as well as contributing to the pet overpopulation problem in our country. Thousands of unwanted animals are euthanized every month in Nashville alone. Please be a responsible pet owner! Pet population is at epidemic proportions!! Consider the FACTS: Over 3.7 million dogs, cats, puppies and kittens are euthanized at shelters across the United States every year simply because there are not enough homes for them. For every animal we euthanize, we destroy a precious life! As a pet owner, YOU CAN HELP this problem cease to exist – or you can add to the problem. Spaying and neutering your pets will prevent unwanted litters. Consider this FACT: if one female cat had 2 litters per year and had 2.8 kittens that were not spayed or neutered, then in 10 years that would result in 80,399,780 unplanned cats! How many good homes are there? Not nearly enough. Now multiply that 80 million by the number of unspayed females across the country. That’s too many for all the good homes out there. My male will feel like a sissy. FALSE. Pets’ urge to reproduce is instinct. They don’t have a sexual identity as humans do. They won’t suffer an identity crisis or any emotional trauma. In fact, since you’ve released them from their urge to mate, they will be happier, healthier pets. My dog is AKC registered. Her puppies won’t end up at the pound. FALSE. Currently, shelters are reporting that approximately 25% of incoming dogs are purebreds. Most of these dogs were impulse purchases. Research any breed you are interested in before buying that cute little puppy you just can’t resist. You may wind up with an unpleasant surprise when that cute little puppy isn’t so little anymore. Dogs and cats should always wear a rabies tag and an ID tag with the owner’s phone number and address. 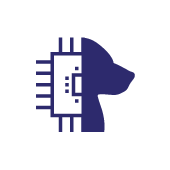 Microchip all of your pets! Animals that roam are 100% more likely to be injured or killed than pets that are kept indoors. My dog won’t protect me if I have it spayed or neutered. FALSE. A dog’s personality is influenced mainly by his home life. Its willingness to protect stems from its love for you and being part of the pack. After having your pet spayed/neutered, it will probably love you more as it is released from the stress of heat cycles, and the urge to roam to find a mate is virtually nonexistent. My pet will get fat and lazy. FALSE. The truth is that pets get fat and lazy because their owners feed them too much and don’t give them enough exercise. You have total control over your pet’s diet and exercise. FALSE. Granted, the initial cost may be more than you want to spend, but think of the hidden costs. The increased diet for the pregnant female, shots for the puppies, veterinarian visits, advertising costs, etc. – not to mention hidden costs of treatment if your pet is affected by certain cancers or health problems that could have been avoided by spaying or neutering in the first place! Shouldn’t children experience the miracle of birth? Well, a more important lesson to teach your children would be responsible pet ownership and concern for life by explaining why their pet should not have babies. Only you can prevent the epidemic of pet overpopulation and euthanasia. Destroying animals is not the solution. Unfortunately, right now, it seems to be the temporary answer. What a waste of precious life! There are also HEALTH BENEFITS to spaying and neutering your pet!! Spaying your female pet before she has her first heat reduces the risk of breast cancer and totally eliminates the risk of uterine or ovarian cancer. It also eliminates the risk of potentially life-threatening uterine infection called pyometra. Neutering your male pet reduces the risk for developing prostate cancer and totally eliminates the risk of testicular cancer. PLEASE SPAY OR NEUTER YOUR PETS !! Surgically altering your pet significantly reduces your pet’s risk for certain types of cancers as well as certain behaviors. Altered animals make better pets and do not contribute to the pet overpopulation problem. Keep all cats indoors! Cats that go outside are hit by cars, attacked by dogs, and fight with other cats which can pass Feline Leukemia and Feline AIDS to your cat. Dogs should always be on a leash when not indoors or in a fenced-in yard. 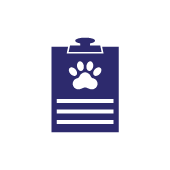 Dogs and cats should always wear a rabies tag and an ID tag with the owner’s phone number and address. Microchip all of your pets! Animals that roam are 100% more likely to be injured or killed than pets that are kept indoors. Dogs and Cats are susceptible to heartworm disease throughout all 50 states. Keeping your pet on heartworm prevention year round is the only way to combat this risk. Heartworm disease causes irreversible heart damage and can cause sudden death. 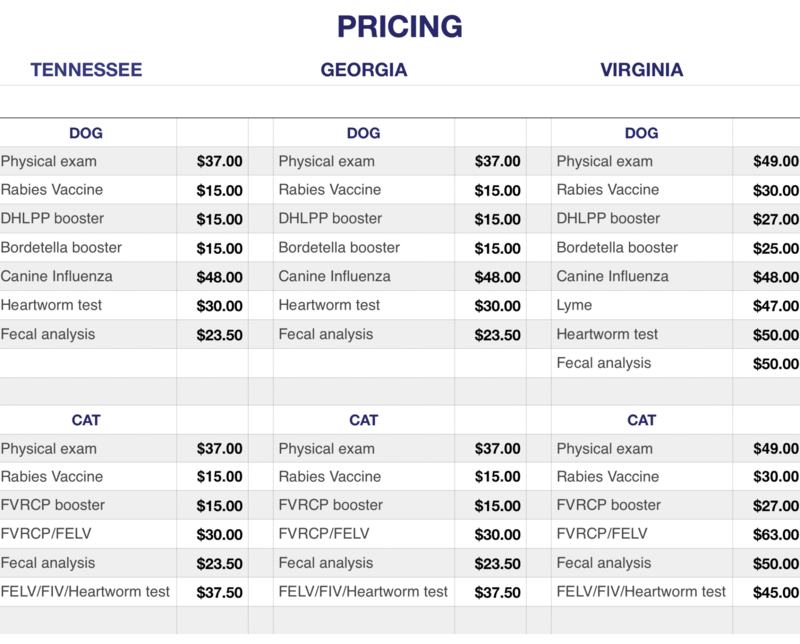 There is no real treatment available for heartworm disease in cats and treatment for dogs is very expensive and not always an option. All pets are at risk for contracting PREVENTABLE diseases if they are not vaccinated. All dogs should receive rabies, distemper/parvo, and bordetella vaccines every year. All cats should receive rabies, upper respiratory, and leukemia vaccines every year. Rabies vaccine is required by state law for all cats and dogs. It has been proven that overweight animals WILL NOT live as long as animals that are at an ideal weight. People food is NOT EVER to be given to animals. Overweight animals are at significant risk for orthopedic disease, diabetes, and certain types of cancers. Flea and tick infestations can cause disease in cats and dogs. Fleas can also spread parasites such as tapeworms as well as cause serious skin problems due to flea allergies. Protect your family from potential risks associated with fleas and ticks by talking to your veterinarian about the right prevention for your pet. Dental cleanings are more important for pets than people because most owners do not brush their pet’s teeth. Plaque and tarter on teeth can cause tooth loss, kidney disease, heart disease, and even death. Most pets need a good dental cleaning once a year after the age of 3.